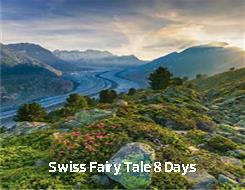 Explore Switzerland's top spots on a 8-day tour starting in Zurich and ending in Geneva. Travel in a small group (max. 16 people) and enjoy the comfort of being personally guided and chauffeured in a minibus all along your journey. You will be staying in 4-star hotels at popular Swiss destinations. Enjoy all of this at an unbeatable price. Airport pick-up and transfer to hotel. In the afternoon enjoy a 2 hour city tour through Zurich with our guide. Overnight stay in Zurich. Join our optional excursion to France (8 h). Gruyères - the culinary destination for cheese lovers!